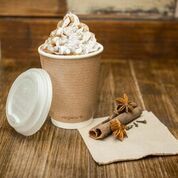 Looking for compostable hot cups, then you are in the right place. 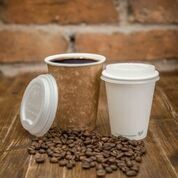 We have a large selection of both double wall and single wall cups in sizes from 4oz up to 20oz. We have updated our Vegware product names to help you find the right lid for your cups, soup containers and more. The series number is is the mm diameter of the matching lid -- Helping you choose the right lid ie 89 series lid fits a 89 series cup. Don't forget as well as lids we can also supply you with cup clutches, cup carriers and many more extras.